John 4:21 Jesus saith unto her, Woman, believe me, the hour cometh, when ye shall neither in this mountain, nor yet at Jerusalem, worship the Father. John 4:23 But the hour cometh, and now is, when the true worshipers shall worship the Father in spirit and in truth: for the Father seeketh such to worship him. John 4:24 God [is] a Spirit: and they that worship him must worship [him] in spirit and in truth. 1. The Context, what leads up to this prophecy? It seems that most of the time when a prophecy of Jesus is discussed it is a prophecy that involves eschatology. This is a subject that is easy to find people who are interested and quite willing to argue about. If this is a good natured argument it can be a basis for much learning while discussing the things that are to take place before the very end of this, the Christian age. It is my purpose however to discuss some well known passages in a little different manner. The passage for today, found in John 4 is well known to anyone who has gone to Sunday school. We usually do not really notice that Jesus gives a prophecy in verse 21 of this chapter. I would like to look at more than this one verse though. It is never good to pull a verse out of context and then expound on the meaning of the verse as it stands alone. All sorts of peculiar doctrines are formed this way. 2. What exactly is prophesied? In these verses Jesus speaks of a time when when neither temple will be acceptable to God for worship. The teaching process of the Old Law is over for God’s people, now it’s time for all of these symbols and types to be put away. It’s time for God’s people to worship Him in Spirit and in Truth. With the heart and with the head. Christianity is not a religion that forces you to leave your intellect at the door. It is a relationship that God through Jesus wants to have with every person. That I may know Him, Philippians 3:10…knowledge of Truth. 3. This prophecy speaks of a time when form will not be the important thing, but entering into worship with our whole hearts, our spirits is the important part of worship. It will no longer matter which hill on which we worship or what sign is on the door. It is what is in the heart that matters. It doesn’t matter whether you worship God in reverent silence or in jubilant adoration, It is what is in the heart that matters. The sign above the church door will not save you, it is giving your heart to Jesus and in faith receiving His sacrifice for sin that matters in that it sets the captive free and saves the soul. 4. This prophecy concerns the sacrifices of bulls and goats at the temple mount that will not be needed any more. A perfect sacrifice would be offered, Jesus the Lamb of God would be offered a sacrifice once and for all. 5. The beginning of Christ’s church is also included in this prophecy. Jesus is the only religious leader who attends every meeting of his followers. The name above the door does not matter, it doesn’t matter which hill the building is on, what matters is what is in the heart of those who attend. Are they born again, are they blood bought? Do we worship in the right temple, or do we worship in spirit and in truth? Do we worship the Jesus of the Bible or one of our or someone else’s making? If we are the blood bought, we are worshiping at the correct place. Each of us are the temple of God, the temple of the Holy Spirit. 6. We can see that this prophecy has been fulfilled and we continue to reap the rewards of what Jesus prophesied and more importantly we are reaping the rewards of what He did for us at the cross. The prophecy has been fulfilled and is being fulfilled. 7. 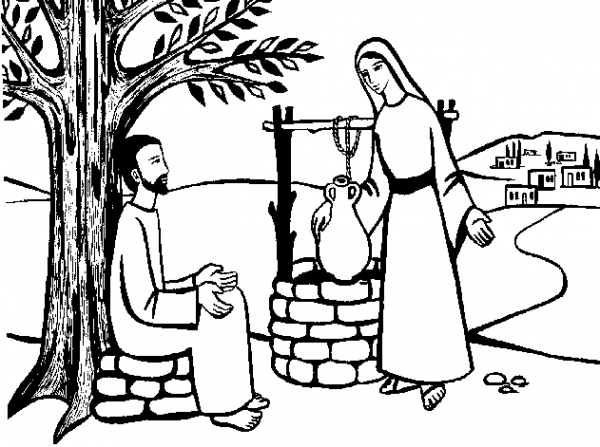 Consequence – First evangelist, The woman went into the city and told the men, “Come see a Man”. Sorry if this upsets your doctrinal apple cart, but the first evangelist in the Bible is this dear woman.